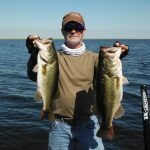 This week on Lake Okeechobee the winds have been from the North/Northeast anywhere from 5-15 mph. The water temp is 81 degrees and the water clarity is good all over the lake. Last Wednesday we received our first real cold front and for a couple of days it slowed things down, but this is the week of the new moon and the last couple of days the shiner fishing has been real good. The water is cooling and with the new moon phase the bigger fish are moving in. On the artificial side the best bait in the morning is still the Spinnerbait and the Swim Jig. A Chatterbait is doing good too. You need to keep moving because the fish are still scattered with all the high water we have now. After the morning bite is over I have been flipping a Crawfish plastic bait at the Cattails and Pencil reeds. Good areas to fish now are King Bar, the Pass, Tin House and Little Grassy.